It’s Christmas and horse lovers everywhere will be tending their animals before opening their presents or popping their first Bucks Fizz! But wouldn’t it be great if our horses could join in the festivities? They might not want to lie, lazily in bed like the average human but there will be some things our equine friends might really appreciate. 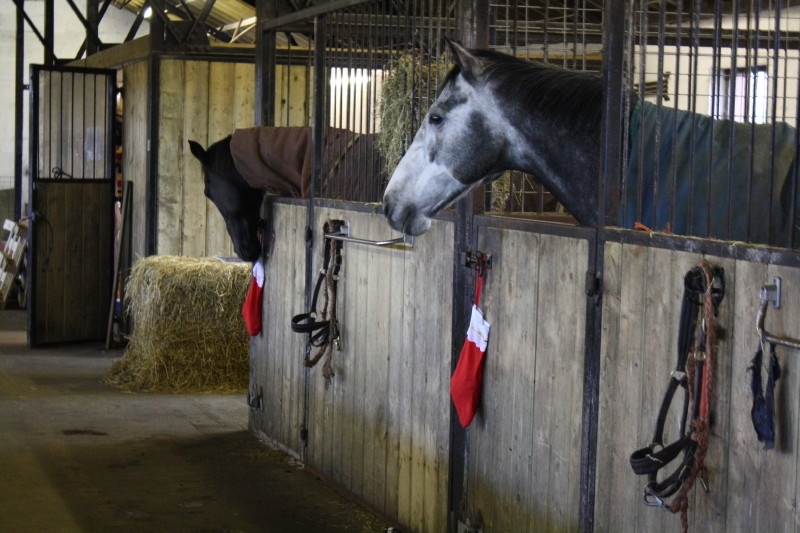 I asked some special barefoot horse owners to reveal what they would love to give their horse this Christmas. Let your imagination roll; have a free rein and spare no expense, I told them. Simon and Katie Earle, who train some of the fastest barefoot race horses in the country – Well we had a good think about it. If money were no object we would be buying the http://www.fmbs.co.uk Activo-Med Combi pro massage rug! All the horses on the yard would then benefit from it. A great product. But we will actually be giving them all a Christmas stocking, filled with herbal treats, a carrot and an apple to say an enormous thank you for working so hard and being loyal servants. Christmas & New Year is important for the racehorses as they turn another year older on 1st January so it is also a time to wish them all a Happy Birthday! 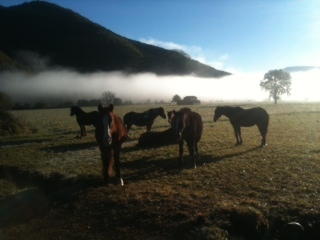 Here is a picture of the horses enjoying their treats last year. 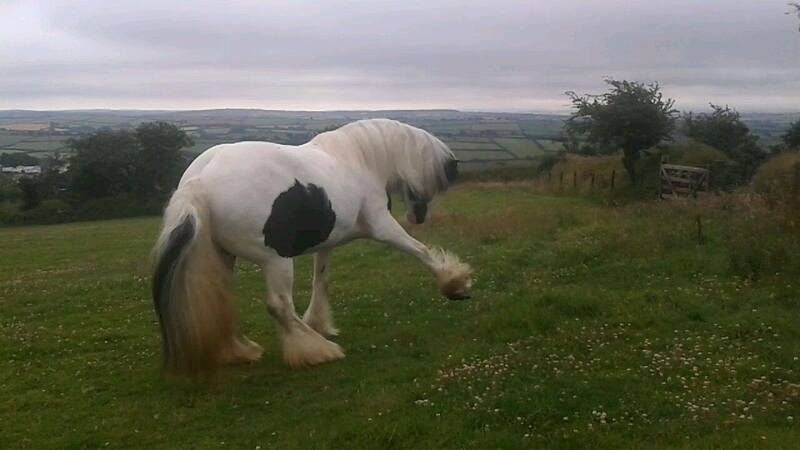 Holly Simons, member of the Barefoot Horse Owners Group – I would give my chap as natural a lifestyle as he would be happy with. I would give him his own paddock paradise track with varied surfaces, a field buddy to play with and a place of shelter for him to wander in and out of as he chooses…I’m still striving to give that to him. I would like to buy The Black (aka Panduc) my former Grand Prix horse, now 29 years old, a time machine so that he and I could travel back in time to when he was younger and armed with the knowledge that we have learnt in the last 20 years we could start again from a new perspective, with the benefit of youth! Mary Joy, who is setting up the Equine Centre for Change, in Sussex – I’d give my herd more ‘undergrowth’ to hoof around in, more trees to strip the bark off and me, living on site so we can smile at each other all day long. The Equine Centre For Change will be based in East Sussex and will be a therapeutic centre where horses are partners in human development and learning. Find the centre on Facebook. Ailsa Page, from Synchrony Horse Works in Wales – I’d like to give them rest and peace….throughout the term they work really hard helping 50 children and young people with needs as diverse as learning difficulties, speech and language therapy, autism and attachment disorders to change and grow. At Christmas they get to kick their heels, have fun being a little herd , eat carrots and relax. They are all rescued horses or donated and most have difficult backgrounds (as do many of our clients) so my other wish for them is a loss of fear and an understanding that they are forever safe and loved and valued. Catherine Fahy, horse owner and member of the Barefoot Horse Owners Group on Facebook – I would like to tell them that I will carry on listening to them and thank them for their feedback. I will strive to keep acting upon it! Tom Ventham and his wife, Julia, and daughter, Molly, walked from Sussex to Spain with their two dogs and a barefoot horse. Now they live in Spain and have acquired a herd of equines. Tom said – There are so many things I would like to give the horses for Christmas – my best bale of hay, carrots and some remedies for the older horses to ease those aching joints. Corrito has so much trouble breathing now; there must be something that can help him! But there is one thing they would really love me to do ‘for them’. To ‘accidentally’ leave the gate open and then to disappear for a few hours. This has happened a few times, so it’s a slight re-enactment. Out here, they can run a long way without being noticed especially if up into the mountains. Luckily tracking a herd of barefoot horses is not that hard. When I find them there’s such a powerful life force amongst them. All their senses are sharp and all their herd instincts are at their best. What an amazing sight- so rarely seen in confinement. Seeing the old horses run like they pretended they never could! A fantastic expression of freedom. So for Christmas I wouldn’t be in a rush to find them – rather I would just track them. Watch them. But you know, it is hard to creep up on a herd of horses especially with a lead rope in your hand. Eventually, I am spotted. There’s a kind of guilty feeling on both sides but you can’t deny that this is where nature intended them to be. I want to give them an adventure this Christmas. From the Barefoot Horse Owners Group on Facebook – Dani Knight – For Christmas I will give my horse a promise to always look after her, make the right decisions on her behalf and try to keep her lifestyle as natural as possible. Why? Because that is what she deserves. 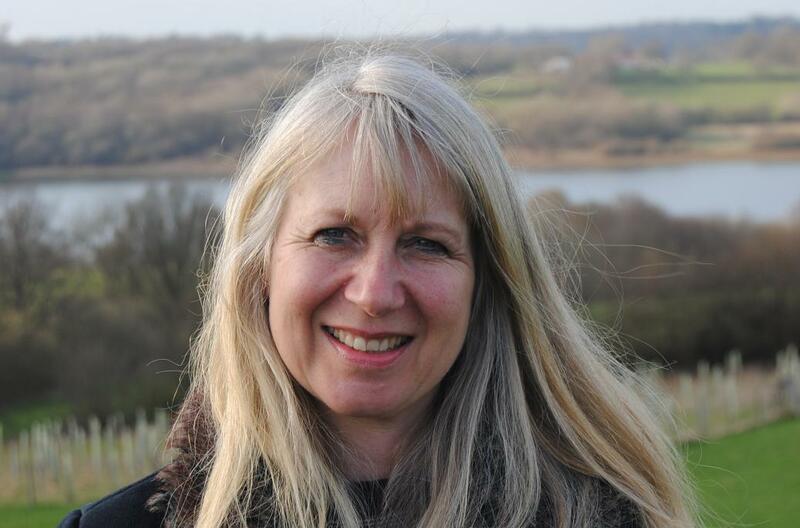 Dayle Dixon – I would like to give my horse another fluffy friend. Why? Because she loves company and is sooo worth it. 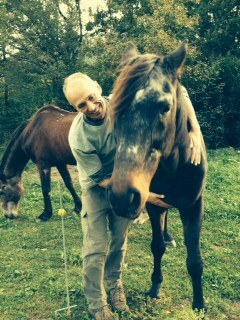 Dayle’s horse – Smiley Miley, below. Look at that bare foot! Louise Hunt – I wouldn’t give my boy anything other than what he’s got, which is a lovely life (I hope he thinks so anyway). But I’d take away the coronary band dystrophy he has. He is the bravest, most beautiful horse I know. Jo Lister, who runs Horse About trail holidays in the Cape of South Africa – What would I give my horses for Christmas? Our horses live a pretty natural and happy life living as a herd in large paddocks with 24/7 turnout. The work load is light so they spend 80% of their time doing what horses do – grazing, walking, chilling. 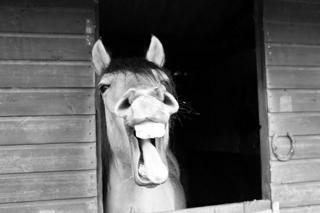 So we think they are mostly pretty happy horses, especially considering most of them are someone else’s rejects. My gift to them would be a mud bath or dam in each paddock. Ah, yes, I see all the riders out there throwing their hands up in horror at the idea of grooming muddy horses, but this is a gift for the horses enjoyment and I have seen how a dam or even a small muddy patch caused by a leaking pipe will have them rolling, pawing and playing in excitement. 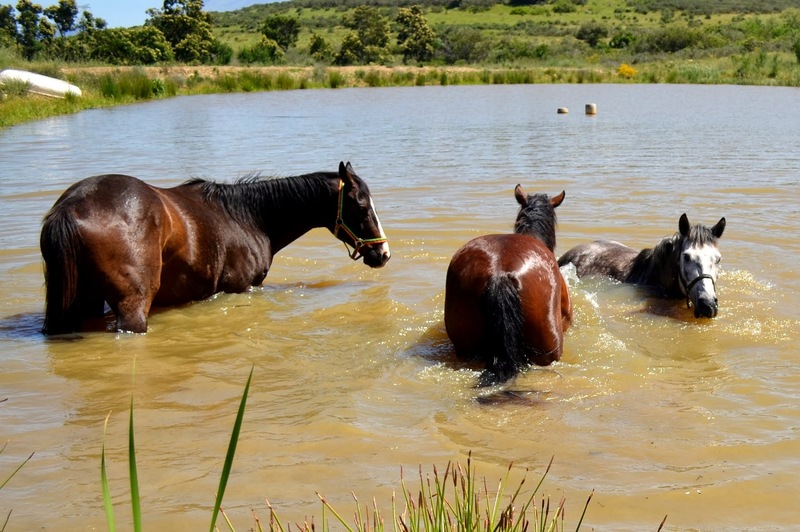 Horses cooling off at Christmas! Their enjoyment is obvious, especially now during our summer months. In addition it is a very natural response to try and keep the biting flies at bay. It is something the horses would love and fulfils a natural instinct! Apart from that there are one or two horses who would like us to install a permanent shower system during the summer months as they come up to the house to demand spraying! This entry was tagged Amazon, books, Christmas, equine, natural horses, riding. Bookmark the permalink. If I come back as a horse i will know where to go! !